The experimental short film “Unsighted” was created in 2015 in direct response to race riots in Baltimore (Maryland) and Ferguson (Missouri) – both the result of the deaths of unarmed black men. Andrea Ellen Reed (*1980) has created a soundscape of edited audio clips of pundits, civil rights activists, educators and newscasters to comment on how black people internalize white supremacist culture. Reed herself is the subject of the film. She confronts the viewer as she watches clips of riots on a computer screen. 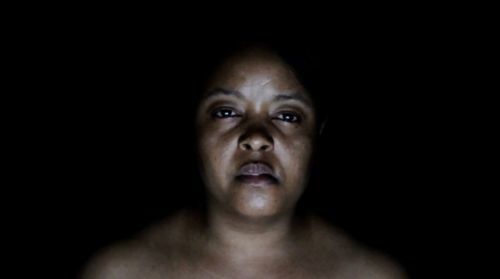 At first glance, this piece appears to be a self-portrait, but as the film goes on, she becomes a representative of the black community – illustrating the slow, steady deterioration of a soul bludgeoned by circumstances.